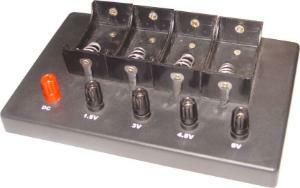 Build five different power supplies by connecting clip leads to one of the five color-coded terminals. You can select between a DC, 1.5V, 3V, 4.5V, and 6V power source. How you connect your clip leads determines how strong your power supply will be. With banana plug jacks for added safety, this battery holder fits four D-cell batteries, not included. With this battery holder, you can conduct a variety of experiments and demonstrate DC, series, open, and closed circuits. A teacher’s instruction guide is included.